Dali Oberon 5 review | What Hi-Fi? If you’re looking for the best sub-thousand pound floorstander, thanks to the Dali Oberon 5, you now have a choice. 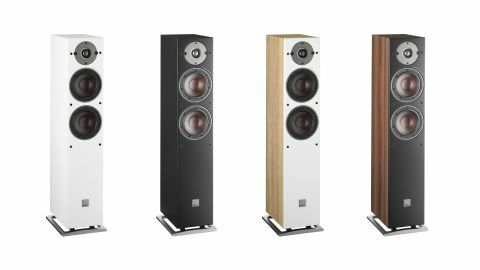 That’s something we haven’t had for much of the last decade, where the answer has been predictable – the current generation Q Acoustics floorstander. In the company’s current range, that’s the 3050i speakers. These are well built, beautifully balanced speakers that have destroyed every rival that has come in their way. But that stops now. In the Oberon 5, Dali has delivered a brilliant alternative, one that might even be a better buy – despite a £50 price premium and substantial size deficit. There are no magic ingredients here, no cutting edge technology to explain the Oberon 5s’ unusually talented nature. Just careful engineering and steady refinements of design ideas that Dali has pursued across its ranges for years, but in this case honed to get the best performance at this price. The Oberon 5s are compact two-way towers, standing just 83cm high and just over 16cm wide. The dimensions mean they will look right at home in most rooms, never dominating visually in the way the larger Q Acoustics 3050i speakers can. The MDF cabinet is nicely made and there are four finish options: black ash, white, dark walnut and light oak. There are a pair of 13cm mid/bass drivers and a larger-than-usual 29mm soft dome tweeter. The mid/bass drivers use the company’s favoured wood fibre/fine grain paper pulp cone, which is claimed to deliver the drive unit holy grail of high rigidity with low resonance. Here, though, the engineers have worked hard on the motor system and suspension set-up to optimise detail, transparency and dynamics. The three drive units are linked through a single-wired two-way crossover, resulting in a sensitivity of 88dB/W/m and nominal impedance of 6 ohms. These figures are typical and shouldn’t present any issues for any good, price compatible amplifier. Like most Dalis we’ve tried, these speakers don’t have a fussy nature. When it comes to positioning, the Oberon 5s like to be a little away from the back wall and firing straight ahead, rather than angled towards the listening position. The tweeter’s dispersion characteristics mean that the speakers will still produce a focused and layered soundstage when positioned this way. As for partnering electronics, you’ll get out what you put in. The Oberons will sound perfectly acceptable with good budget electronics such as the Marantz PM6006UK amplifier and partnering CD player, but feed them with something more ambitious, such as the Rega Elex-R (£950) or even Moon’s 240i (£1990), and they shine accordingly. Once given a few days to settle, these are terrific performers. They’re responsive, musical but, most of all, fun. We start with Radiohead’s In Rainbows and the Dalis sound right at home among the complex rhythms and dense production. But they bring out the emotion too, highlighting the haunting nature of Videotape or the uplifting change of gear in 15 Step’s instrumental break, where the shift in bassline character changes the feel of the track. The Oberons have the dynamic subtlety, rhythmic precision and sheer transparency to make the most of such things and pull the listener into the musical experience. They’re detailed too, revealing low level instrumental strands with ease, but also managing to arrange that information in a composed and organised way. The leading edges of notes are well defined, but not highlighted unnaturally. The sound simply flows in an organic and convincing manner. Dali speakers are rarely shy when it comes to treble output. The brand doesn’t tend to play safe by dialling back treble in a bid to improve refinement. Instead, these speakers have a crisp high frequency output with plenty of bite, but a smooth enough response to avoid sounding brittle if provoked by less than perfect recordings or poor partnering equipment. This bold but still balanced treble output blends seamlessly with the speaker’s expressive midrange performance. The Oberons sound great with voices, squeezing the last drop of emotional impact from Nina Simone’s heart-breaking Strange Fruit. We move onto Prokofiev’s Romeo And Juliet where the Dalis show-off their fine dynamic reach and ability to render low level shifts with skill. They will play loud enough for most situations and in all but the largest of domestic settings. Despite being compact, those twin mid/bass drivers still deliver plenty in the way of low frequency punch and authority. Overall, these speakers manage to sound notably larger than they are. The Q Acoustics 3050is dig even more deeply into the bass, but lack the sheer expressiveness of these Dalis, particularly through the mid and higher frequencies. Having a choice is great, and being able to choose between the Q Acoustics 3050is and Dali Oberon 5s really is a win-win situation. Both are superb. If you have a large room, the Q Acoustics edge it, while in most other circumstances the Dalis’ greater sense of fun gets our vote.